When Ralph Griffiths put out his call to recognise people who have made a difference on Galiano Rick and Dorothy Beauchamp immediately came to mind. Rick and Dorothy first came to Galiano in 1982. They felt it was a good fit for them in that the community reminded them of Nelson. They camped at Montague and were able to do this in the spring and fall while they had only a toddler. Once their second child was born and their first child was school-aged, they decided to try to find a piece of land on which to put a trailer so that they could come to the island at other times. They managed to scrape enough money together to buy the McRae’s land with a cabin in Montague Harbour. They were able to manage this because the McRae’s carried part of their mortgage. A few years ago they renovated the old cabin into a beautiful home and garden. Rick and Dorothy grew up in Nelson, B.C., another small community where volunteering plays a key role in the community life. They met in high school and married during university. Dorothy became an elementary teacher and Rick an orthopaedic paediatric surgeon. As youth both were involved in guides and scouts. Dorothy volunteered in a care facility and later, as an adult, was a guide leader for over 25 years. Rick volunteered as a Classifier with the International Cerebral Palsy Sports Association for Bocce tournaments. He travelled to England, Rio de Janeiro and Argentina in this role. Rick and Dorothy have been role models for their 3 children who now also volunteer in their communities. Rick and Dorothy were part of the running community in Vancouver for 20 years running races from 5k to marathons (Dorothy ran 8, Rick ran 7). They opened their home every year to their multi-age running group for a soup party, building community in the city. If it is a Monday Soup and Bread likely you’ll find Dorothy in the South Hall kitchen chopping and Rick doing a lot of dishes with surgical precision in the “dish pit”. When asked what motivates them to volunteer both say that they wanted to help out in the community if they could and that they love the community aspect of the Galiano Club. They enjoy (and contribute to) the camaraderie in the Hall kitchen and enjoy touching base with others. Rick likes volunteering in positive situations that don’t involve meetings. He likes dishwashing, chopping vegetables and grating cheese. Dorothy likes doing anything in the Hall kitchen. 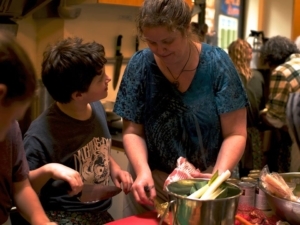 They like the social and connecting aspects of the Food Program and especially appreciate the leadership that Alison Colwell provides the Program. Rick and Dorothy have been involved in other aspects of the Food Program and community including Nettlefest and the Community Picnic where Dorothy has won first prize in many food contests. Rick has served on the Health Care Centre Board, helped paint the South Fire Hall years ago and Dorothy worked for the Wine Festival. Rick and Dorothy have talked about how rewarding they find volunteering in this community. I would say that the Galiano community benefits enormously from their contributions. Thank you, Rick and Dorothy! Community Games Night turns the South Hall into a giant family living room. Tables are set up with Scrabble and Battleship, Risk and Connect 4. There are decks of cards, and a Twister mat on the floor for the younger kids. 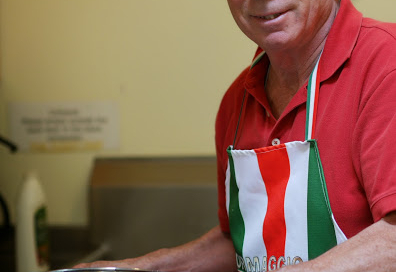 It began as a way for the Food Program to hold an evening kitchen to stock the freezer with meals for seniors, but has since grown (as do so many of our food program ideas) into a much-loved monthly event. Games Nights happen once a month, on a Thursday, between 6 and 8pm. The cost is sliding scale: $5-$10 per person. 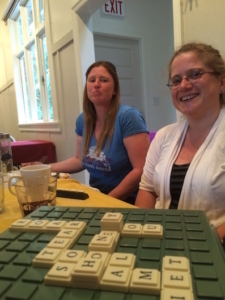 Sometimes people bring their families with them for a chance to connect over a board game, others just meet up with friends (or make friends) when they get there. Someone is always looking for a partner to play a new game with. Everyone is welcome, and we have dozens of games to choose from. Usually we have a feature game. Someone offers to teach a game to anyone who wants to learn. We’ve featured Chess, Mancala, Mexican Domino Train…we’re always interested in getting suggestions of games you’d like us to feature. 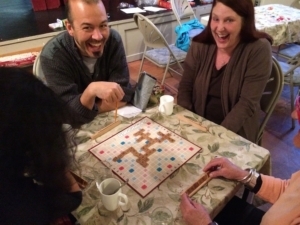 So if you’ve never been before, come join us for Games Night, and a chance to connect with your family and neighbours over a friendly game of Chequers or Settlers of Catan, and you can see why everyone enjoys Games Night. And if you would like to help in the kitchen, that would be wonderful, we always need volunteers from 3pm till 6pm, or for clean up after. Thanks to the Galiano Parks and Rec Commission for helping this program run for another year, as it gets closer to being self sufficient. Come join us at the South Hall for a raucous evening of games with your friends and neighbours! We will have snacks and a simple supper. Tonight we have Healthy Turkey Chili with Molasses Sunflower Bread, Cheesy Baked Beans, lots of pizza, green salad with Donuts for desert. Everyone is welcome! Suggested donation: $8. Volunteers needed. This project is funded by the Government of Canada’s New Horizons federal government, through New Horizons for Seniors Program. We will have snacks and a simple supper. Everyone is welcome! Sliding scale $5-$10. Volunteers needed. Soup and Bread (formerly known as Meals for Seniors) is one of the most loved and successful projects the Food Program runs. I’d love to say we planned it that way—but of course we did not. We started making soups for seniors in May of 2011, and in that first kitchen we put 95 soups in the freezer. The project began as a response to the need for good, low cost, nutritious meals for seniors on our island. We worked with the Tuesday Walking Group to distribute those soups to seniors who wanted them, and I used to knock on doors at Page Drive. Local farmers help supply produce when they can (they still do). We had 6 kitchens that first year. In the Spring of 2012 we started opening up the hall for lunch. We thought that as we all took a break from the kitchen and sat down to eat together, the community might want to come and join us. Now, three years later, we are open for soup twice a month, and sometimes more than fifty people come eat with us. Those people that can pay $5 for lunch do so and support the program, but no one is ever turned away hungry. In 2012, in response to grumbles from seniors who were getting tired of just soup, we started making frozen meals. That year we had 8 kitchens and made 70 meals. Fast forward two years. 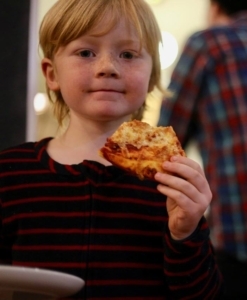 In 2014 we had 22 kitchens and made more than 1200 meals! Compare that to 6 the first year. At least 95% of those meals go to seniors (55+). Did you know that our frozen soups and meals are available for $5 at the Tuesday Walking Group at the Lions, the Health Care Centre and the South Hall? Soups are distributed through the Food Bank and the school. Over the last four years the project has been continually changing, and growing and feeding people in this community. We have a super group of community volunteers who make all those meals and soups, and we couldn’t do this without their amazing dedication. As the program grows, they need help! It doesn’t matter if you can’t stay the whole time—a new person peeling potatoes or washing dishes is always appreciated! There are lots of different jobs, and no experience is necessary— just the ability to follow directions and have fun. Everyone is welcome. 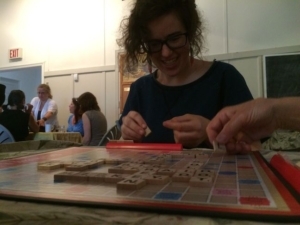 Do not pass Go – Come straight to the South Hall for an evening of games with your friends and neighbours! There’s “Free Parking” – Come and go as you please – there will be lots of snacks and a simple supper. Everyone is welcome! The price is right! $5 admission, or $10 for a family. Volunteers needed. Supper’s Ready has been funded by the federal government, through New Horizons for Seniors. The Food Program’s “Soup for Seniors” project began a number of years ago when we were looking for a way to provide easy, locally made meals for our seniors. In the first year volunteers came together once a month and made big batches of soup, which we’d freeze and distribute to any senior that wanted them. Whenever possible we use local ingredients from our island farms. Over time, we’ve become more “professional”! We still make the soup, but we’ve expanded our menu, and now we also make simple meals such as: shepherd’s pie, mac and cheese, Indian butter chicken, beef bourguignon, turkey pot pies and lasagna to name a few. We’re always perfecting our recipes and trying out new dishes. Everything is frozen in one- (or two– depending on your appetite) serving size, oven-ready foil containers. The soup and meals are available at the Lions Walking Group on Tuesday mornings, and anytime, by meeting me at the South Hall. (Feel free to call me—2363—I’m often there, and you can pick up meals anytime.) The cost of the project is covered by the suggested price of $5 a meal or bowl of soup. We appreciate all those that can pay, as that covers the costs for those that cannot. So feel free to stock your freezer with tasty, locally made-ready-made meals and soups. A couple of years ago, when we realized that people would be happy to join us, the kitchen crew, for lunch, we opened up the Hall for “Soup and Bread” lunches. And lots of you do come and eat with us. Which is fun for us, and helps raise more funds for a great program. Soup’s always hot and the bread is fresh out of the oven. So if you are free for lunch on April 28th, come join us at the Hall from 12:30 till 1:30. 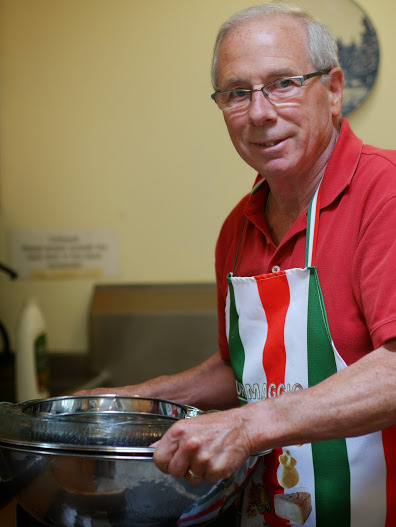 We’ve got some great soup, fresh bread, all cooked by some amazing volunteers. And if you want to come cook with us—we can always use extra hands. The next soup making kitchen is scheduled for January 23rd at 11:30am at the South Hall. When we have made the soup, we always stop, and sit down together before we begin clean up and packaging. This month, we would like to invite any seniors who would like to, to join us for lunch, just soup and bread, at about 1:30pm. Cooks and enthusiastic participants needed! Update: 14 volunteers made 74 containers of soup of three different varieties: Turkey Vegetable with Pasta, Caribbean Squash Soup and Hearty Lentil Soup.